The official blog for Rev. Peter Fonseca, a priest of the Archdiocese of St. Louis. Fr. Peter Fonseca is the second oldest of Dr. Peter and Mimi Fonseca’s 11 children. 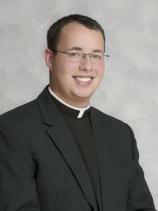 After graduating from St. Louis Priory School in the spring of 2007, he entered Kenrick-Glennon Seminary. Upon graduating from the seminary with an Master of Arts in Theology and an Master of Divinity he was ordained a priest for the Archdiocese of St. Louis in May of 2015 by Archbishop Robert Carlson. Following ordination, while serving as the associate pastor of Queen of All Saints parish, Fr. Fonseca undertook graduate studies in biomedical ethics. He completed a certificate in health care ethics from the National Catholic Bioethics Center and a Master of Science in Bioethics from the University of Mary where he was chosen by the faculty as the distinguished graduate student. Fr. Fonseca currently serves as the associate pastor of Sacred Heart Parish in Florissant Missouri. In addition to his canonical assignment he serves as a consultor to various parties in the Archdiocese of St. Louis and the greater St. Louis area on bioethical issues and serves as a consultant on the Archdiocesan Worship Commission. Additionally, he teaches biomedical ethics and apologetics to seniors at John Paul II Preparatory School and serves as the department chaplain to the Florissant Police Department. Fr. Fonseca has focused his research in numerous fields including, the issue of cryopreserved human embryos, gender identity disorder, physician assisted suicide, situations of apparent futile care, and the patient-clinician relationship. He has presented at various conferences / seminars across the country and has contributed to local television and radio programs.